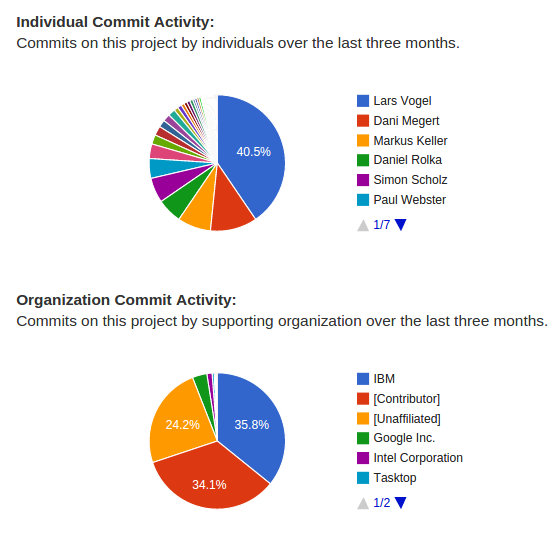 It is amazing how many quality contributions we received over the last months in the Eclipse platform project. For example 50 different people contributed source code to the Eclipse platform.ui project in the last 6 months. I’m proud to say that we at vogella GmbH are also very active in the platform team. Simon and myself are trying the help as much as possible. Here is screenshot of the Platform.ui project homepage. vogella GmbH is currently not listed as organization here, as we currently prefer to contribute development resources instead of money to the Eclipse project. We have certain areas which we find important and plan to work on. While these activities do not provide direct user value, we think on the long run they will pay out very highly for the end user. We try to review as much as incoming Gerrit reviews as possible. We also try to coach new contributors to become eventually new committers. We have the advantage of developing Eclipse plug-ins and RCP applications with our customers and delivering on a regular basis Eclipse Plug-in and RCP training and workshop sessions. During these activities we frequently see inconsistencies and usability issues in the Eclipse IDE. We plan to work on these. This also means for us to contribute to PDE, JDT, m2e and other components of the platform. Together with our virtual friends from Google and IBM we work on improving the interactive performance of the Eclipse IDE. I blog about this in a later post. This mainly improves migration existing components to the Eclipse 4 programming model so that other projects can easier use the Eclipse 4 programming model. We very much enjoy working on the Eclipse platform and we start to see more and more contributions. Good times ahead for the Eclipse IDE. This entry was posted in Eclipse, Lars Vogel and tagged E4, Eclipse platform, Eclipse4. Bookmark the permalink. Thanks for the help and keep it up ! thank you very much for the great work and your commitment! We all appreciate it very much! Thank you for your great work especially for your books about Eclipse 4 development. In work i have to use the 3.x API because IBM is not updating there Expeditor platform, but when the 4.x Api gets more mature maybe IBM will update there products to the new platform.